The normal angle between the femoral neck and shaft is 130—160 degrees. Blood supply to the head is through multiple arteries. Anastomosis from the lateral femoral circumflex artery, medial femoral circumflex artery, and inferior gluteal artery contribute to the blood supply of the femoral head. Blood vessels form two arterial rings with connecting ascending cervical branches along the neck of the femur. The foveal artery, which is a branch of the obturator artery, supplies the head, but it is not sufficient after interruption of the branches from the arterial rings. Healing of the neck fracture depends on the extent of the injury and displacement, the age of the patient, adequacy of reduction, osteoporosis, and comminution of the bones. 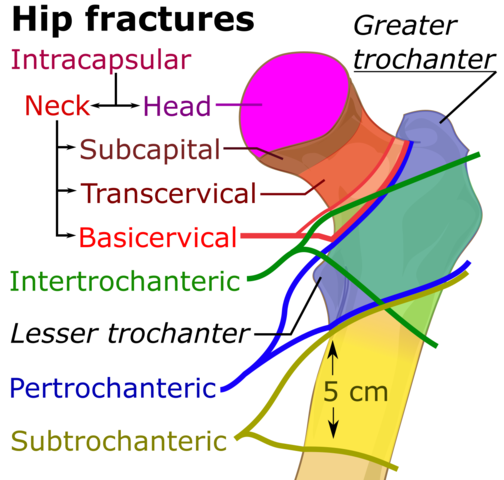 These types of fractures have been associated with a high risk of avascular necrosis and non-union. Displaced fractures will disrupt the blood supply to the head and will lead to complications. The overall outcome of patients with a femoral neck fracture depends on the displacement, preserved vascular supply, quality of reduction and fixation. Elderly populations have an increased risk of a fractured neck of the femur due to osteoporosis and high risk of falls due to neurovascular lesions, medications, dehydration, and cognitive impairment. Mortality from femoral fractures can be up to 10% in some areas in the United States, and the risk is still high in the first year after surgery. The incidence is more common among old white women. Athletes are more prone to stress fractures with a change of the normal routine quality or strength of exercise. Femoral neck fractures among children have been associated with high energy injuries. Extracapsular: Range from the base to the pertrochanteric region. Class II complete fracture not displaced. Class III complete fracture partially displaced. Class IV complete fracture fully displaced. Femoral neck fractures can be traumatic or stress fractures. A direct fall on the hip, completion of fatigue fracture or twisting of the body over the hip are all possible causes of a fractured neck in the elderly. In young adults, the femoral neck fracture is usually a result of overuse and major trauma, e.g., a fall from height or motor vehicle accident against the abducted hip. Older females present with a history of a fall, such as fall in a bathroom and the sudden onset of pain and loss of function in the thigh region. 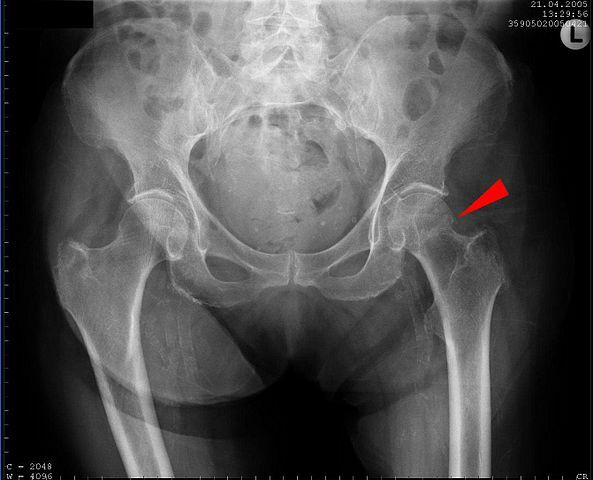 Young athletes with a long history of hip pain may be present in impacted stable fractures. A history of amenorrhea and eating disorders also predisposes to the fracture. The pain is insidious with a stressed fracture and is associated with exercise and weight bearing, but relieved by rest. It is usually located at the hip, medial thigh and buttock, or sometimes referred to the knee. Displaced fractures are associated with shortening of the limb, abduction and external rotation of the leg. Patient ambulation varies according to the fracture onset and type. Patients may still be able to ambulate with a non-displaced fatigue femoral neck fracture. A stable impacted stress fracture may present with chronic hip pain and immobility. 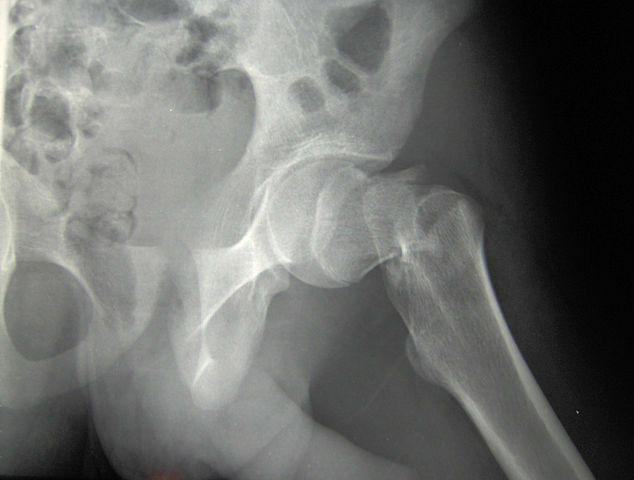 Avascular necrosis or osteoarthritis can also be discovered accidentally during X-ray films. Note: The physical examination starts with an inspection of the skin for ecchymosis, any limb shortening or deformity, muscular atrophy or asymmetry and any visible associated injuries. Palpation of the hip joint should examine any tenderness, range of motion limitation and muscular spasm. Neurological examination of the spine and lower limb should be performed to exclude any sensory or motor abnormality. Complications are common and may still arise after surgical treatment. Avascular necrosis is common with displaced fractures due to interruption of the blood supply to the head of the femur. The risk can exist for up to 3 years following the surgery. Periodic scanning is recommended for early detection of avascular necrosis of the head. Patients present with pain and limitation of movement. Imaging with MRI or bone scan is preferred to detect early avascular necrosis of the femoral head. X-ray is not recommended as it might take 6 months for changes to be detected by X-ray films. Treatment in the elderly consists of a total hip replacement while, in young adults, a trial of VGFG or THA is utilized. Nonunion is one of the most common complications with a likelihood of up to 30% and it is more common with displaced fractures. Patients present with similar fracture pain following surgery or recurrent pain after improvement. Nonunion depends on several factors including age, comminution of the fracture, bone density, degree of displacement and surgical reduction and fixation. Arthritis of the hip joint due to degeneration of the articular cartilage is a late complication that may result in long-lasting hip pain. Other common complications include wound infection, deep vein thrombosis, and pneumonia. Plain X-ray is the first imaging modality of choice, but it is less sensitive especially with stress fractures. An X-ray may be normal or show a fracture line without displacement or even abnormal angulation between the head of the femur and the shaft. It may also indicate the presence of comminuted fragments and loss of joint angle. Other work-ups include venography, interosseous pressure monitoring, MRI, CT scans and PET scansetc depending on the nature of the injury. Bone scanning is more sensitive in detecting stress fractures than plain X-ray; however, its specificity is not reliable and it can take days before the fracture line can be seen with a bone scan. MRI is more accurate in visualizing linear stress fractures as early as in the first 24 hours. MRI is the most sensitive and specific in detecting femoral neck fracture with better visualization of the joint anatomy and deformity with zero radiation exposure. The first step in the management of a patient with an intracapsular hip fracture is adequate analgesia with intravenous opioids. It will help with pain management and decrease complications e.g. delirium. A full assessment of the patient with trauma survey to exclude any associated injuries that need urgent intervention e.g. subdural hematoma, pelvic fracture or spinal injury is necessary. Clinical evaluation of the patients for any associated morbidities, diabetes, thyroid and parathyroid functions and renal functions is a must for adequate management. Investigations should also look for the etiology of the fall including fall management and future prevention. Thromboembolic prophylaxis should be considered due to proven efficacy in decreasing the mortality in patients with femoral neck fractures. Patients are susceptible to deep vein thrombosis and fat emboli due to surgery and prolonged recumbency. Traction of the femoral neck in the anatomical position is done by some centers to decrease the pain and help with the deformity, but it has not been proven effective. Note: In patients with a tension side stress fracture and displaced head, the risk of avascular necrosis is high with disruption of the blood vessels to the head. Emergency orthopedic surgery is recommended for fracture fixation and restoration of the level of function. Restore blood supply to the head of the femur. Achieve rigid fixation of fracture fragments. Young patients have choices of HIP Spica, moores pins and arthrodesis. Adolescents should have the fracture fixed with dynamic hip screws (DHS) or cannulated screws. Elderly patients should undergo fixation with dynamic hip screws or get a total hip replacement. Open reduction and internal fixation procedures have a better outcome in terms of less probability of bleeding and infection, while arthroplasty is better in terms of healing and less liability to nonunion or avascular necrosis and subsequently re-operation. Conservative treatment is reserved for patients who are not good candidates for surgery or with an impacted non-displaced fracture.